Club Med proposes a new luxury experience of living together: a stay in a prestigious Villa on a beautifully preserved site on the Turkish Riviera. 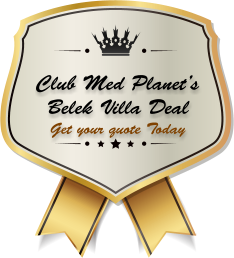 The Villas of Belek are 55 kms (34 miles) east of Antalya in the region Belek, internationally renowned for the quality of its golf courses, such as the Lykia Links, just next door to the Villas. The region is also famous for its archeological sites such as the ancient theatre of Aspendos. Our exceptional Villas have a quality concierge service dedicated to your comfort and wellbeing. Each Villa has its own private outdoor swimming pool and paddling pool, private indoor pool and sauna, in an ideal environment where you can spend luxury time with family, friends or partner.